Not that long ago, you were thrilled to have a puppy or kitten of your very own. You never dreamed you'd have to give him up someday. Undesirable or difficult behavior is one of the most common reasons people give up and surrender their pets to the shelter. So, you're not alone! The thing is, when you got that cute ball of fur and brought him home, he needed some lessons on how to behave in a family. And he still does -- it's a lifelong process; just like children :-). Believe this -- even old dogs & cats can learn new tricks! It may not take as much as you thought to teach your pet and keep him as the loving, family member you saw in him that first day. Now, more than ever, he needs you to make the right choices for his future. There ARE solutions to many types of behavioral problems, which typically result from lack of training, lack of consistency in training or lack of positive reinforcement. Most behavior problems aren't that hard to solve. "Pet behavior advice from ASPCA experts 24 hours a day, from your computer. 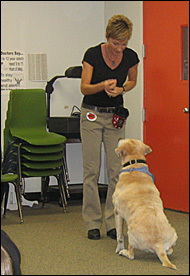 A nationally recognized team of animal behaviorists offers possible solutions to a wide range of issues at no charge. With our easy-to-use database, you'll receive step-by-step advice-without leaving home." HSUS "Pet Care and Behavioral Tip Sheets"
The resources in this manual are mostly derived from the Best Friends' Pet Care Library listed above. The manual is intended to be a guide for all dog lovers who want to know more about the Best Friends' way to care for and train dogs. From the Humane Society of the United States, this interactive tool is designed to help solve the most common cat behavior problems (litter box issues, scratching, biting, fighting, or is simply upset or scared). We do not have volunteer trainers on staff and, as such, are unable to provide professional pet behavior advice at this time. However, we will do our best to help you keep your pet using information from the resources listed above. Pets In Need Action League is not responsible for any injuries to anyone using the techniques described in the resources listed above. Any person using the techniques described in these resources does so at his/her own risk.